Mayans M.C. 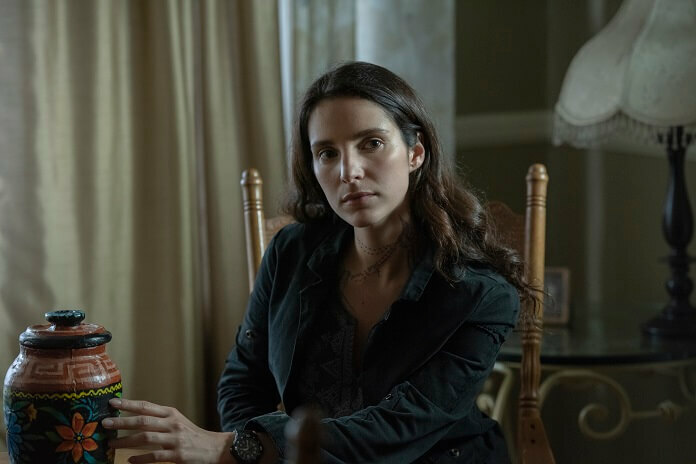 Season 1 Episode 7 Recap: "Cucaracha/K’uruch"
FX’s riveting new drama, Mayans M.C., continues with season one episode seven airing on October 16, 2018. The episode titled “Cucaracha/K’uruch” begins inside EZ’s trailer. EZ (JD Pardo) places mini-cassettes in a brown paper bag. At the clubhouse, Bishop (Michael Irby), Taza (Raoul Max Trujillo), and Tranq (Frankie Loyal) are discussing what went down at the border with Miguel Galindo when Angel (Clayton Cardenas) interrupts with a story to tell. He lies and says the reason they lost Dennis during the chase is because they came across soft dirt and Gilly fell into what they later discovered was an old tunnel. That tunnel led to another tunnel that was obviously in use and reached a half mile into Mexico. The other end led to Vicky’s place. Angel apologizes for not revealing this earlier, saying he was worried about the heat it would draw with everything else that’s going down. Bishop accepts the story and instructs Angel to keep it to himself for now. Angel receives a text from Adelita and, along with EZ, heads to the warehouse. They then take off on a short road trip on this side of the border, and Adelita (Carla Baratta) asks about their family. They explain their dad never remarried and still talks to their mother’s ashes. They drop Adelita off at a parked car in the middle of nowhere, and Angel promises to explain everything to EZ once they meet up with Coco and Gilly. Meanwhile, Dita Galindo (Ada Maris), Emily Thomas (Sarah Bolger), and Devante (Tony Plana) wait outside the border patrol station. Miguel’s still locked up inside, suffering the indignity of being splashed with another inmate’s urine. Back at the clubhouse, Angel’s apparently told his group what’s about to go down with the rebels. EZ’s then sent out to work on the motorcycles while Angel and his people are called into a meeting. Galindo’s current state of incarceration is discussed, and it’s pointed out that it’s unusual Galindo hasn’t been sprung by his lawyers. Despite that, they’ll go about making the runs as usual. EZ’s outside when Chucky (Michael Ornstein) pulls up with Coco’s daughter, Letty (Emily Tosta). Coco asked to see her and Chucky’s brought her in and is very enthusiastic about preparing her a delicious breakfast. After the meeting breaks up, Coco (Richard Cabral) introduces the club to Leticia who’s busy eating a hearty breakfast from Chef Chucky. Bishop whispers to Chucky, wondering if this is the girl he saw with Coco. Tensions ease up a bit when Chucky confirms she is. Bishop, showing he’s a decent dude, gives Coco the day off to hang with Letty. EZ takes his place on the run. The day’s also just beginning for Felipe (Edward James Olmos). He speaks to his dead wife and then realizes her urn is missing. He’s shocked to find Adelita inside his house and she’s the one who moved the urn. Felipe demands to know her identity and she calls him by his real name without revealing hers. She then pulls out a copy of the same photo Felipe keeps hidden in a locked box, although her photo is torn and doesn’t include the severed heads. The man in the photo with Felipe is her father. She watched him be murdered by the cartel while she was hiding in a heating vent. She also saw her mother and baby brother butchered. Felipe realizes she’s Pedro’s kid and she reveals she’s now going by Adelita. He wonders how she found him, and she admits it was through his sons who’ve been helping the rebels. She does, however, assure him his sons don’t know about his connection to her father. Felipe cuts to the chase, asking what she wants. She explains that when she was six the Galindos tracked them down and killed her family. Her father had to watch as they cut her brother and mother to pieces. Galindo told her father he had been betrayed by a friend, someone who broke his sacred trust. They then decapitated him. Adelita believes Felipe sold out his old partner. She’s there to kill him, but Felipe has information she’s missing. Agent Kevin Jimenez (Maurice Compte) shows up at work and informs his supervisor that EZ’s giving him a bag today. Unfortunately, it’s too late and Kevin’s being dismissed from the case. They’re going to bring in EZ Reyes using local cops, and Kevin realizes that will expose Reyes’ actions to the club. The supervisor doesn’t care, and Kevin accuses him of not caring because EZ will be just another dead Mexican. “You’ll probably get a bonus for that in this administration,” says Kevin before being booted from the office. Back at Felipe’s, Adelita continues to hold a gun to his head as he opens the locked box with the photo. He shows her his copy, complete with the severed heads. He explains they sold their souls to the cartel, showing other photos of their atrocities. Felipe goes on to explain her father remained in after he quit. His wife was pregnant with Angel, but her father was still single and continued to work for the cartel. Felipe claims he didn’t keep up with Pedro after he fled that life. Adelita wants to know who else would have been aware of Pedro’s whereabouts. Felipe believes it was the person who took the photo, the third member of their small group who did everything together. The man’s name was Rodrigo and he’s a priest. He’s also the one who created Felipe’s new identity. It’s possible he did that for Pedro, too. The Mayans meet up with Sons of Anarchy on the road and it’s hugs all around. The club’s making a deal with SoA for weapons and as the product’s exchanged EZ gets a call which he ignores. That’s followed by a text warning him something bad’s happening and to pick up the phone. Kevin calls and tells EZ he’s been pulled off the detail and EZ’s deal is over. EZ lets Kevin in on the fact Galindo was arrested at the border. “Don’t cave on me. You need to steer clear of the Mayans. They put out a BOLO,” warns Kevin. Kevin hangs up and then stealthily follows his supervisor as he leaves the office. Back in lock-up, a massive inmate wants Galindo’s shirt. After Galindo taunts him about being less than a cockroach, he takes off his shirt and uses it as a weapon to take down the larger man and choke him until he’s unconscious. Galindo delivers a stomp to the chest followed by spitting in the man’s face to finish up the one-sided fight. Elsewhere, Coco takes Letty back to his mother’s place. They argue over food, her missing car, and a dead body. Coco tries to make peace by promising her another car, but she’s not satisfied. She doesn’t believe Coco cares about her and is just using her to take care of Letty. After his mom leaves the room, Coco hands Letty some cash for food and whatever she needs. When he takes off, his mom returns, grabs the money and suggests Letty get back on the street to earn her keep. Letty’s so upset she locks herself in the bathroom and bangs her head against the toilet, bloodying her face. Deal done, the club gets back on the road. A cop nearby spots them and gives chase. Out on the street, the cop calls in backups and everyone’s forced to pull over. The club’s now carrying guns and realize they need to stay cool, but EZ also knows he can’t be questioned in front of the Mayans. He rides back over to the officers parked 100 or so feet back, tells them he’s the guy they’re looking forward, kicks a squad car door shut, and rides off. The cops pursue EZ as he flees, giving the club a chance to ride off. EZ’s finally cornered and beaten, although he’s in no way resisting arrest. Back at the border it’s been 18 hours since Galindo was arrested. Devante confirms he called the lawyers, but right now there’s nothing they can do. No one’s sure who is in charge because of the chaos at the border under the Trump administration. However, Devante doesn’t think it’s the Feds because they like to openly wield their power and haven’t taken credit for Galindo’s arrest thus far. Elsewhere, Kevin follows his supervisor to an office complex and waits outside. Inside, the agent can’t remember the code to a locked room but the personnel inside eventually let him in anyway. Sons of Anarchy antagonist Asst U.S. Attorney Lincoln Potter (Ray McKinnon) is running the war room. They get word EZ has been picked up when Kevin decides to make his presence known. Kevin barges into the secret meeting, revealing he’s invested two years on this case and EZ just gave him info that Galindo’s being detained at Calexico East, something that comes as a shock to this group. They realize Galindo has in fact been off the grid for 26 hours. Potter orders teams sent out to find Galindo. He also tells Kevin his deal’s still in play and that they’ll drop the BOLO on EZ. Galindo is pulled from the cage in the public lockup area and taken to an out of the way room. He’s in handcuffs and not told what’s happening. Adelita steps out of the shadows and asks the border patrol officers to remove the handcuffs. The officers leave her alone with Galindo, and she confirms his son and family are safe. Adelita reveals the Galindo cartel slaughtered her family but this is much more than just revenge she’s seeking. She wants his cooperation and makes a phone call while opening up her laptop with a live feed of his poppy fields, his distribution hubs, and his refinery. She gives the order and the fields go up in flames along with the refinery and distribution centers. He doesn’t seem to care and doesn’t believe it will impact his business. She then places live feeds of every single one of his facilities on the screen, telling him she’ll take them all out which will open up spots for smaller drug dealers to move in. Plus, he’ll be busy in the US courts and won’t be able to rebuild. Miguel realizes the kidnapping was just to set up this play. Adelita shocks him by revealing she wants the rebels and his cartel to work together. Taking him out won’t stop the violence, and every level of government is infected including social services and health care. She’s willing to let the devil secure their future and evil feed the children. The rebels are 2,000 strong and she’ll put them to use to make sure no one takes down the Galindo cartel. In return, she wants Galindo to give money to the rebels to use to help the poor. Miguel wonders how they’ll ever trust each other. She suggests they tell the truth and reveals her real name. She also suggests they use a third party to keep them honest, for now. At the clubhouse, the club thinks EZ acted to keep the rest of the Mayans out of trouble. He wasn’t carrying any weapons, so he led the cops off on a wild goose chase to distract them from the rest of the club. He might be charged with reckless driving or speeding, and Bishop tells Angel his little bro has balls. Just then EZ shows up and he’s summoned to the meeting room. He’s been beaten and is icing his arm. EZ explains he let them catch him once he knew the club was out of range. They didn’t charge him with anything because it would have been a lot of paperwork for just misdemeanors. They beat him and let him go. Bishop calls EZ a smart kid, however he’s angry that the prospect went rogue. It could have led to one of the Mayans getting killed by angry cops. EZ apologizes and Bishop warns him once more and he’s out. Being tossed from the club will come with a severe beating that will make what the cops did feel like a day at the spa. As EZ walks out of the clubhouse, Chucky drives up with Letty. She looks horrible and claims her grandmother almost killed her. Coco sees his daughter and heads out, telling EZ to clean Letty up. Coco breaks down his mother’s door while she’s relaxing in the bathtub. She’s able to get up and grab a knife but believes she’s safe when she sees it’s Coco. Coco punches her in the face, knocking her back into the tub. She threatens to call the cops and end him, but Coco finishes her off by holding her head underwater as she struggles for breath. Meanwhile at the border, Miguel’s handed his son. The border patrol agents set him free and as he walks down the hall, Adelita tells him she’ll be in touch. The Galindo family’s at home when Miguel arrives with the baby. A happy family reunion ensues. Things aren’t so rosy for Riz who’s caught by the club using the tunnel outside Vicky’s place to smuggle in two Hispanic females and a baby. That night, EZ goes to his dad’s. Felipe’s not there but the box with the photos and Felipe’s real history is sitting on the table. EZ appears stunned while he looks through the box’s contents. Back at the Galindo home, the reunion continues until all the lights suddenly go out in the house. They believe it’s just a brown-out and Paco goes outside to check the electric panel. Paco’s confronted outside while inside candles are lit. Noises are heard outside and everyone heads off different directions, leaving Emily alone holding the baby in the living room. She finally follows the path Miguel took and reaches the front door. Outside, Asst U.S. Attorney Lincoln Potter and the DEA have already placed Miguel and his men in custody.